I love watching Bob Ross paint his happy little trees. However, on occasion Bob will do something that really bothers me emotionally. What almost killed me was that Ross would paint a very intricate and beautiful mountain, or a bunch of happy little trees on a mountain ridge and then…I’m getting all worked up remember it…he would practically destroy the thing by putting a big fat tree that covers almost everything he just painted. For a solid 10 minutes I’d sit there shocked and quivering and not able to enjoy my Fruit Loops while I watched this afro-wearin’ painter make something beautiful and then taunt me by destroying it. Then slowly…ever so slowly…I started seeing what he had already created in his mind 15 minutes ago. Suddenly what seemed like a disaster turned into a masterpiece. Bob, you beautiful genius, you did it again! I think the Lord paints the same way as Bob Ross. You get the idea from Ephesians (2:10, 3:7-13) that God is painting this beautiful masterpiece of redemption. 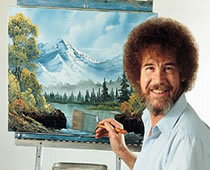 He is displaying on the canvas of history a bunch of happy little trees that resound to his glory. At times it is absolutely beautiful and looks almost complete. He does the unthinkable. He covers up those happy little trees with that squirrel-infested log it looks a bit unbecoming. We were comfortable with the happy little trees of buzz words like “gospel-centrality”. We thought the picture was nearing completion and filled to the brink with beauty. Then the Master decided to draw a big fat tree of emphasizing holiness right in the middle of it. We did not know it but the canvas was not complete. It was missing something. And so He continues painting. Sometimes, in our view spoiling things that seemed quite beautiful only to emphasize something that at first looks detestable. With his Paul’s, his Augustine’s, his Monica’s, his Benedictine monks, his his Luther’s, Edwards’, Newton’s, Moody’s, Graham, Pipers. And covering them with his praying widow, his baking grannies, his humble maintenance men, and his weary pastors. Some shine more than others but all are essential. They each emphasize something different that would be an incomplete canvas without their presence. History moves back and forth with each stroke. And often making a watching and waiting church quite uncomfortable. Yet, he keeps painting. And when the Lord gets done with his painting, all of creation will sit back and say, Lord, you beautiful genius, you did it again! Sometimes, its not that fun to be the canvas! Some of my best memories are coming over to my Dad’s house for lunch (I worked near him) and we would watch Bob Ross together. There are so many spiritual lessons to be learned while watching him. There’s a pattern here that has implications in other areas as well. One common school of painting fine art is to finish a painting one section at a time. So you may see a subjects face and torso completely painted, but the subject’s arm only exists as a pencil sketch directly on the canvas. Ross’ style was different. He would paint the background first and then paint foreground elements in layers on top of it. The effect is to have brush strokes for background objects that don’t stop where it borders a foreground object. So you get the sense that there is something unseen that serves as a background for the foreground objects. A good novelist will have background information that is alluded to, but not fully revealed. This is not a common trait. Most writers love their backstory and want it to be part of the main story. One reason we know that the Bible contains accounts of actual events is that there are references to events, people and places that it doesn’t cover elsewhere. There is a richness that typically isn’t found in fiction. LOVED this post. I rolled it into my youth group this past Wednesday. It was a perfect illustration and it revived my interest in Bob Ross paintings. I remember watching them on Ch 8 in Houston when I was a kid; along with Yan Can Cook and The Electric Company. Thanks, Greg. Glad you could use it.